This activity will help you get below the surface-level understanding of the problem to identify what is causing the problem, and what is contributing to the problem. Diagnosing root causes requires that we ask – and try to answer – explanatory questions. Explanatory questions often start with the word ‘why’, and are framed in a way that positions one thing in relationship to another, for example, Why are people hungry when there is food available at the market? This is a process of testing what you think are the root causes or contributing factors to the problem you have identified. You should expect to challenge some of your initial assumptions and guesses as to why the problem is occurring, and hopefully gain some deep insights from the information and evidence that you have gathered that will help you understand the causes and contributing factors better. You may find that you are looking at the problem the wrong way, or that you have misunderstood the problem. In some cases, you may even find that you should be focusing on a more fundamental problem than the one you initially identified. Whether you decide to stick with the problem you originally identified or address a deeper issue, this is completely ok! Digging deep into causality can highlight power and conflict dynamics. As discussed elsewhere, it may be worth carrying out a conflict or power analysis to ensure that you understand the local political, cultural, religious and power dynamics before embarking on these exercises. Be wary of whether causes and contributing factors change over time, and across the phases of the disaster management cycle, and as always, try to engage affected people in the analysis of the problems wherever possible. How a problem is defined, and who defines it, is critical to how it is addressed. You now have a rich collection of information on context, past efforts or existing services, and the problem at hand. But here we need to move from the what (which is largely a function of exploratory and evaluative analysis) to the why (a function of explanatory analysis). To do this, we recommend using the 5 Whys to look at causality. Working in groups, or in pairs, take turns digging into why your problem is happening by working progressively through the whys. One person should play the role of problem holder, and another person should play the role of the interviewer. The problem holder should introduce the problem, and interviewer asks ‘Why is this happening?’ The problem holder should respond, the interviewer should record the answer on the template or flipchart paper, and the group should discuss and debate the answer. It should be plausible (likely), credible (reliable), backed by evidence, and objective (ie, not subjective). Again, the interviewer asks ‘Why is that?’ followed by a response and further discussion. This process repeats for a total of five responses, or ‘levels’. This can be a difficult exercise to facilitate. It can be hard or uncomfortable for participants to come up with so many answers if they are not used to thinking in this way (for example, in countries where rote learning is common). The repeat questioning involved in the 5 Whys can also be inappropriate in some cultural contexts, particularly across social hierarchies. If you are organsing or facilitating this exercise be sure to clearly state the purpose and expectations. There can also be a tendency in the humanitarian sector to just blame ‘the system’, without making the effort to be more specific and identify exactly what the ‘systemic’ issues are. Similarly, be wary of falling into the dead-end trap of blaming ‘lack of funds’. Make sure that you are specific in your answers and encourage creativity. What are the direct and underlying symptoms of this problem? What is contributing to it? 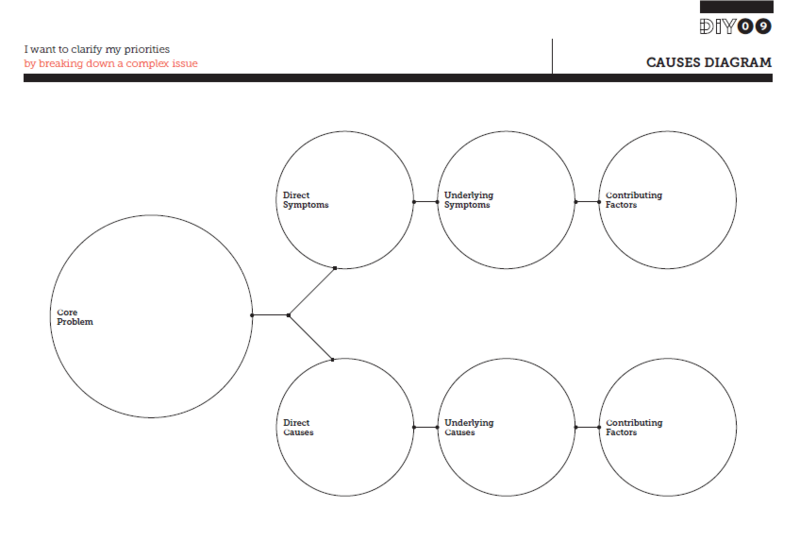 Use the Causes Diagram to analyse the information and evidence you have gathered to date. 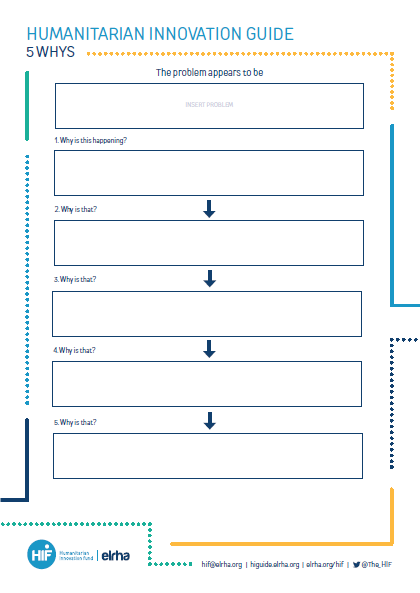 Use the information and insights from your Starting Point Assessment, and from the 5 Whys exercises (if you have completed it) and map them onto the diagram. If you are doing this in a group, make sure that you leave the time and space to debate and discuss. It can sometimes be hard to distinguish between a symptom and a cause!